for vienne: how do I trust again? I fear that I have been misguided. I fear that my prayers were naive. I had no clue I was so naive. When I entered into motherhood, I really fully believed, with utmost (naive) confidence, that if I surrendered my children to God and covered them with the power of prayer, regularly, that they would be protected. I believed this beyond a shadow of a doubt. I prayed this with authority. 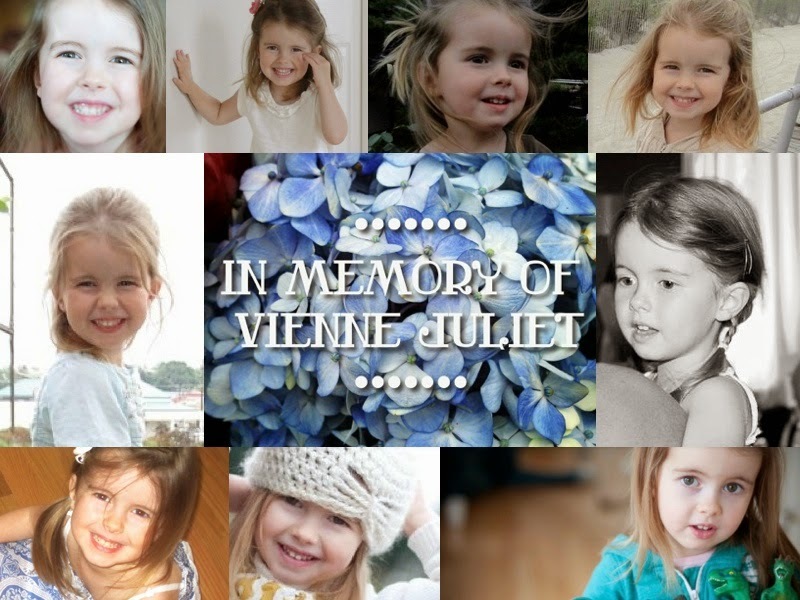 I would go into Vienne's room at night and ask God to send His angels to stand guard over the four corners of her bed. My biggest fear EVER on this earth has been of losing a child...but I never believed it would happen because I was so confident in my prayers over their safety. Vienne, even, was so confident. She believed with such a beautiful unwavering faith. She would often make a bed, next to her bed on the floor, just for Jesus. She would ask me to ask Jesus to come and sleep next to her. Jesus, why did you not protect my Baby????!! Why did you betray me?? How am I ever supposed to pray with confidence over Ivy's safety now? Why the hell should I? What is the point of praying if you're still going to allow this kind of horror to happen? I don't know if I will ever be able to trust like that again. I have seen, now, that it doesn't work. The ultimate worst has happened. I know I won't stop believing in You. But, my view of prayer and trust is forever altered. Oh, honey. How my heart aches. I so understand these feelings...I struggle on this line as well. And yet, I know my feelings can not be depended upon fully right now. What I KNOW of Jesus is what I will eventually have to land on (heart versus head). How I pray He reveals Himself in all this, that somehow our trust is restored and even, somehow, strengthened...that somehow HOPE will be realized. I don't know how that will happen, the reasonings of my head and heart don't line up...so much argument there. We may never have an answer to our unending question "why?" this side of eternity and that is frustrating and maddening. Some say to turn our "why" to a "what"...like "what do You intend in all this, Lord?" I know all the pat answers to that one...right now, I'm camped on "why". But I do have to look back in history and see the many, many times God has pulled through, the many times prayer HAS been answered one way or another - and I know I don't want to risk NOT praying or choosing not to believe, as you say...the alternative is not a risk I will take. I could drive myself to maddeness trying to reason this one out, I could. At some point I will need to choose differently, to trust, to keep my sights on our pending reunion with Vienne. And yes, right now I want to see Vienne more than I do Jesus when I get there. I believe He understands these things we are wrestling with - He's heard it before, He can take the brunt of it. I pray the enemy gains no foothold through our grieving, through this unfathomable loss...that somehow Jesus will reveal Himself and draw us back. I want to honor Vienne in that - she loved Him so - and I need to believe she is safe in His arms, which continually conflicts with my present accusations of Him. I realize it just may have to be a choice on my part, that supersedes feelings. Is my faith big enough? It certainly feels smashed to the ground. Yet, He said it needs only to be as big as a mustard seed. I love you, my daughter, my friend. Oh Jules and Jenny - my heart is breaking with you both. Julie you couldn't have said it more eloquently or beautifully. Praying non-stop for you both as you walk through this dark valley. Hang in there Jenny. One day at a time. wow. these words both you and your mom speak are so raw and real. I think that's why I love you both so much! because you are willing to be REAL and share what your heart truly feels. Your emotions are real and you need to express them. Every angry thought and feeling are felt by us all. I so wish your questions could be answered, that there was not so much "unknown" in this life. I always try to remember that He does see the picture from beginning to end, and even though that does not take any of the hurt away it somehow always brings me an odd peace. I am constantly praying for you and for a glimmer of restorative peace in your heart. That peace that passes all understanding. Even in a time when your heart hurts so bad that there is not even room for peace, I pray it still somehow shows it's face. I read this post days ago and have been thinking of it ever since. I have no answers and have been even hesitating myself and feeling like a phony when I pray with Makayla each night for Gods protection. I SO agree with you feeling betrayed by God because you did not deserve for this to happen to you and had so much faith. I think as mothers we have a delusion that we are somehow in control. If we pray enough, read the right books, feed them the right things, teach them to be cautious, try to keep them safe- somehow they will be. But I guess the truth is that we really have no control and sh%& happens to good people. I'm really angry for you and not sure how to tell you to have faith or trust again.